Knitting and Baseball and Cats, oh my. 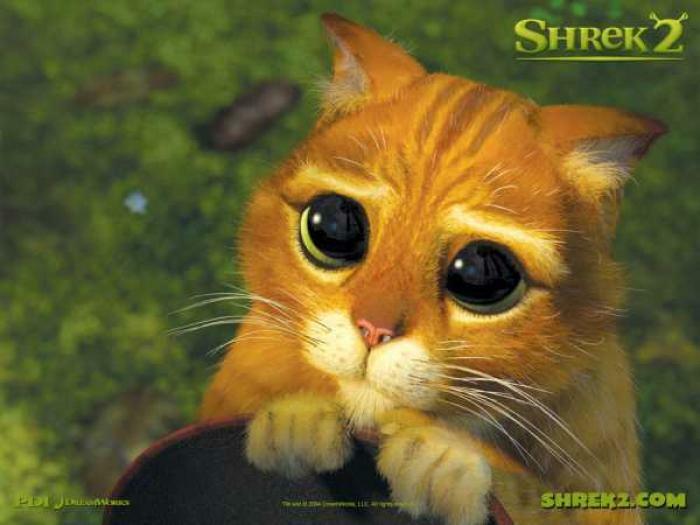 Do you happen to need a Shrek Hat? Well, I’ve got a pattern for you! 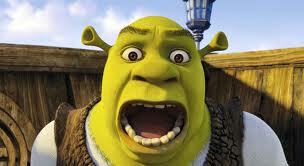 I was contacted by the costume designer for the school play at my son’s school, asking if I could knock out a pattern for Shrek hats for “Shrek The Musical”, which is happening at school next month. We found a pattern on Ravelry, but it was in super-bulky yarn (first problem: it’s not easy to find super-bulky yarn, let alone in an appropriate shade of Shrek green), featured a spiral rib pattern (second problem: keeping track of the pattern, especially at the top where it decreases), and the ears were crocheted (third problem: I have only rudimentary crochet skills). So here’s my pattern, which avoids all that. It’s written for bulky-weight yarn, is plain stockinette except for a smidge of ribbing to stabilize the brim, and the ears are I-cord. Round 1: *Knit 4, knit 2 together; repeat from * to end of round, knit any remaining sts. Round 3: *Knit 3, k2tog; repeat from * to end of round, knit any remaining sts. Round 5: *Knit 2, k2tog; repeat from * to end of round, knit any remaining sts. Round 7: *Knit 1, k2tog; repeat from * to end of round, knit any remaining sts. Round 9: *Knit 2 tog; repeat from * to end of round. Break yarn, leaving 6″ tail, thread onto yarn needle, draw through remaining stitches on needles and draw tight. Weave in end on underside. Cast on 7 sts. Work in I-cord (remember to pull yarn tightly behind your work at the end of each row) for 9 rows. Increase Row: k1, kfb [knit in front and back of stitch] in next 5 sts, k1. Turn your work and purl back. Bind off, leaving a 8″ tail. Use the tail to make the bound-off edge a nice round circle. Then thread the tail down through the ear to the bottom. Attach the ears on opposite sides of the hat about 2″ down (I sewed them down where the decreases begin. You’re done! I-cord is easiest to work on double-points, but you can work it on straight needles or circulars as well. Note: If you are using double-points, you will be sliding the sts from one end of the needle to the other without turning. If you are using straight needles or circulars, you will need to move your sts from the right hand needle to the left hand needle without turning at the end of each row. Cast on 7 sts and knit one row. The working yarn is now coming from behind on the left-hand end of stitches. DO NOT TURN. Slide the stitches back to the right-hand end of the needle, WITHOUT TURNING, so that the working yarn is coming from behind on the left-hand end of the stitches. Knit the stitches (it is okay that the yarn is coming from the “wrong end” of the work. You are making a tiny tube.) This is I-Cord. Continue with directions above to complete ears. Thanks, Cassandra! It was fun to figure out, especially those ears! And I hear you about knitting time – mine seems to go in waves. For a while I have nothing but knitting time, and then months go by and I can barely crank out a sock. Your knitting time will come!! You are so smart and creative. This is such a cute hat. I wish I was knitting more these days…. 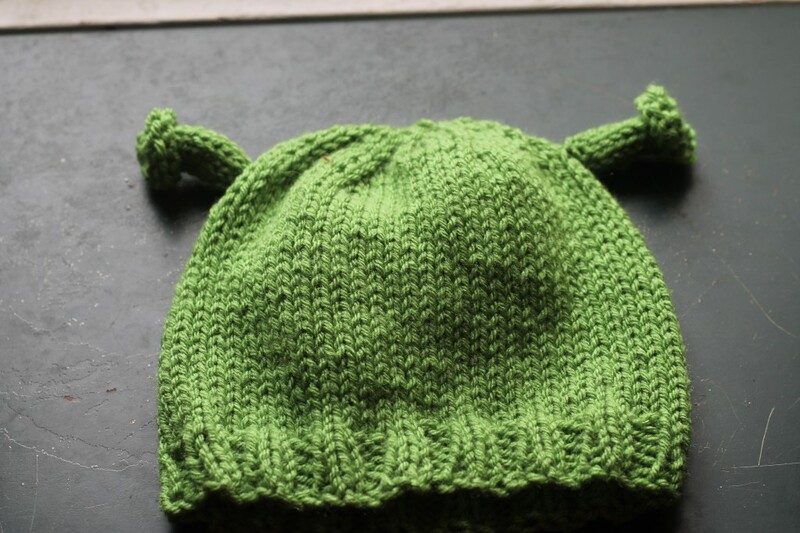 Diana Jordan on Free Shrek Hat Pattern! Cassandra Aldridge on Free Shrek Hat Pattern!